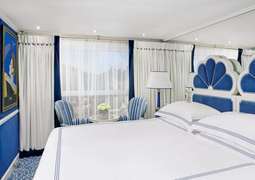 Lavishly appointed riverview staterooms and suites feature open-air and French balconies on the Main and Upper Decks. All staterooms and suites have handcrafted Savoir® of England beds, 100% Egyptian cotton linens, built-in closets, a hair dryer, safe, individual thermostat, flatscreen TV with infotainment center, bottled mineral water, and a safe. Marble bathrooms feature L’Occitane en Provence products, plush towels, towel warmer, and bathrobes and slippers. Gourmet cuisine prepared fresh daily with the finest ingredients, often brought onboard from local markets. International chefs from London's five-star Meridian Piccadilly and Relais & Châteaux Hotels. Uniworld offers their guests a variety of different dining experiences, so in addition to buffet breakfast and lunch, and sit down dinner all of which have open seating, Uniworld has introduced a number of new dining options that include: al fresco dining on the sun deck, weather permitting; "Lite" lunch and dining options on the sun deck, weather permitting, and in the lounge; "Early Riser" breakfast and afternoon tea. The cruise focus is on exploration and walking tours with local guides. Tour variations continue to expand to meet the requests of guests. Travel lectures expand your knowledge of the regions visited, and the Epicurean Adventurer Program enhances your appreciation of local cuisine ashore. There is a lower deck Cinema. Visiting entertainers come on board along the route. A Family-Friendly program is offered during school holiday times.